I’m opening up about some of the thoughts I've had thus far during my pregnancy and sharing a baby bump update! Since so much has changed since my last baby bump update, I decided it was time to write another blog post devoted to the thoughts and feelings that have developed as my pregnancy has progressed. Some may argue that the last place you want to be is inside the mind of a pregnant woman, especially one in her third trimester, but I found that sharing my inner thoughts has been extremely helpful. The encouragement and support that I've received from YOU has been such a tremendous blessing, even more so when I hear that I'm not the only person who has thought or felt certain things. I hope you'll indulge me again by letting me share this bumpdate with you. The past several weeks have been such a roller coaster ride, and I need to just get some things off my chest. If you're willing and are curious to see what's been on my mind, then keep reading! Baby R is growing and growing (and growing! 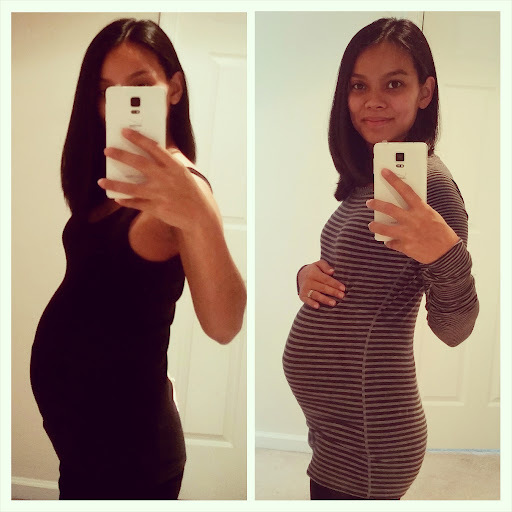 ), as is evidenced by the baby bump photos that I've been sharing on Instagram. I'm facing the reality that Stephen and I will be meeting our baby is just a couple of months (I'm due two months from today! ), and while I'm excited to finally hold the baby in my arms and to see what the baby looks like... I have to admit that part of me is growing more and more terrified with each passing week. There is still so much to do (in my opinion) before the baby is born, and I'm not entirely sure I'll ever finish everything on my list. I've been trying to concentrate on the most important items so I don't overwhelm myself and wind up having a panic attack, but there are times when what I feel is important isn't important in the grand scheme of things. It's frustrating having to reconcile those situations because, well, I can be stubborn. Especially when I have a firm idea of how or why or when I want something done. Thankfully, I have an incredibly strong support network of people that I can reach out to when I want to talk things out. That network includes Stephen (of course), select family members, and some of my dearest friends. Honestly, without that network, I would be a wreck right now! I just pray that I've remembered to let each and every one of those people know how much I love them and how grateful I am to have them in my life. Now that I've expressed genuine sentimentality, let's get on with the bumpdate! I still love feeling how active Baby R is in the womb. When I'm sitting on the couch, there are moments when I can actually see the movements he or she is making. Every somersault, every roll, every wave... they each make me smile. And, it's better when Stephen sees the movements from where he's sitting. Also making my "favorite moments" list are the conversations that Stephen and I have about the baby. It makes me so incredibly happy to see how excited Stephen's getting about the baby's arrival. I know, inside, we're both dealing with our individual fears and anxieties about becoming parents, so seeing and sharing our excitement is extremely special. One of the cutest things to develop since my last bumpdate is having other people asking me whether I'm getting enough food. (Or, more specifically, having other people asking me whether Baby R is getting enough food!) During the week, I over-pack my lunch bag so I have plenty of food options when I'm at the office... but that doesn't stop some of my coworkers stopping by my desk with offers of snacks and treats. Even though I've only been working since mid-December, it's sweet how some of them have stepped up to make sure I'm taking care of myself (and the baby!). Energy-wise, I'm all over the place. Going back to work full-time has required most of the energy that I have during the day, so by the time I get home and have made dinner, I don't have much left for anything else, which has made tackling my baby-related to-do list next to impossible. When I find myself in a fit of elevated energy, I try to get as much done as I can. Interestingly enough, there aren't any updates to share with respect to potential baby names either. We haven't merged our individual lists yet, but with only 9 weeks to go, I'm sure we'll start debating with each other about names soon! I alluded to one of my cravings earlier in this post. And that craving would be for donuts, specifically glazed donuts. I stop at Dunkin' Donuts on my way to work every morning for coffee, and it has been so, so hard ignoring the temptation to order one (or two). I treat myself every now and then, but those treats aren't enough to satisfy the craving and the thought of donuts dances around in the back of my mind constantly. It makes me wonder how I'll feel about donuts after the baby is born! Aside from donuts, the only other craving I've had has been for Dole Whip. Unfortunately, that's not exactly something that Stephen and I can readily get in Pennsylvania. I had a doctor's appointment last week, and according to them, everything looks good in terms of my weight gain. At that point, I had gained 19 pounds. This is the biggest I've ever been, and there are days when I get really emotional about my weight, the shape of my belly, and the fact that I still have 9 weeks to go. I know the weight gain is temporary and that it's happening for the good of the baby, but, sometimes, it's still hard for me to wrap my head around it. Yes, I have them now. Sitting is more difficult because of my growing baby bump, and sitting for too long causes my lower back to ache. Some nights, I can't get comfortable when I'm in bed, so sleeping has been difficult. And, every now and then, I get to deal with leg and/or foot cramps. That doesn't mean I'm not looking forward to having some of those aches and pains dissipate after the baby is born. At this point, I'm still wearing a mixture of non-maternity clothes. In terms of bottoms, maternity pants and yoga pants are the most comfortable for me. If it weren't so cold, then I'd still be pairing my non-maternity dresses with leggings or tights. But the dresses have been trapped in my closet for the past few weeks. As for tops, my focus is making sure whatever I'm wearing is long enough to cover my baby bump so I'm not accidentally flashing bare skin when I lift my arms. I did just order some new maternity tops and sweaters that I have yet to debut, so I'm looking forward to adding them to the rotation. The emotional ups-and-downs I was expecting in my first trimester have finally made an appearance. Rather than experiencing major mood swings, however, I'm finding that I'm feeling my emotions much more deeply that I was a few weeks ago. So when I'm happy about something, you can really see it on my face. As for my negative emotions, the presence of slow tears streaming down my cheeks is the first indication that something is wrong. Usually I'm able to pinpoint why I'm angry or upset or disappointed, which helps me resolve the problem more quickly. But, I'm not going to lie... There are days when it's supremely difficult to keep everything in check. The job I started in the middle of December keeps me pretty active. Even though it's, technically, a desk job, I'm constantly getting up to pick things up from the printer, to scan documents, and to interact with others. The walking around is good for me, so I'm grateful that I'm not sitting all day long. But... that's about it in terms of exercise. Though, I have been doing some light stretching each day, which certainly helps with my aches and pains! I mainly excited about finally getting to meet the baby that has been growing inside me for the past 31 weeks. But, I'm also looking forward to my baby shower in a few weeks. While I'm not privy too exact details, I know that a lot of love is going into planning the event and I can't wait to celebrate Baby R's approaching arrival with family and friends. If you made it through this entire post, thank you! With my due date getting closer, it's almost hard to believe that my next big update about Baby R may actually be the announcement that he/she has been born! Five years ago: Ten in 10: You Mean That Wasn't You?